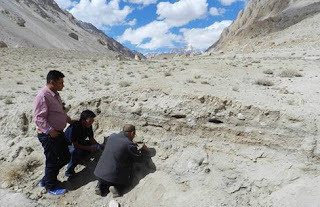 An ancient camping site dating ninth millennium BC has been discovered by the Archaeological Survey of India (ASI), under Ministry of Culture, on the way to Saser La which leads to the Karakoram Pass in Ladakh. While exploring in Nubra valley during 2015-16, Dr. S.B. Ota, Joint Director General in ASI observed both sides of hill and valley as the serpentine road, gradually climbed along the Saser Stream. After covering a distance of about 22 km, he noticed a section, exposed due to road construction, showing successive layers comprising burning residue and immediately stopped to explore the area. It was a small flat area with snow-covered peaks on one extreme, dry barren land with loose rocks all around and gushing stream within the deep western gorges, an ideal place for camping in a picturesque setting. A charcoal sample collected from the Site, was subsequently sent to BETA LAB, Florida, USA, for radiocarbon date determination in order to understand the antiquity of the above stated camp-site. The outcome i.e. 8500 BC (10500 years before present) was beyond even ASI’s expectation. Such an early antiquity on the basis of a scientific date was the very first for that region. Realizing the significance of the evidence, a team of ASI officials including D.G. and Dr. Ota, Joint D.G. and other experts inspected the site in the month of July 2016 in order to assess the probabilities of further archaeological research. During this visit, more charcoal samples and associated bones were collected. Two of the charcoal samples from lower and upper deposits sent for dating have provided new radiocarbon dates of c. 8500 BC and c. 7300 BC (c. 10500 and 9300 years before present) respectively. These dates have indeed confirmed the earlier date. Apart from that, new dates also indicate repeated human activity at this camping site for about eight hundred years. Preliminary studies of charred bones collected from here, carried out by Prof P.P. Joglekar of Deccan Collage, Pune, have shown the presence of Gorel and Yak.